The 2014 NFL Thursday Night Football schedule has been released. 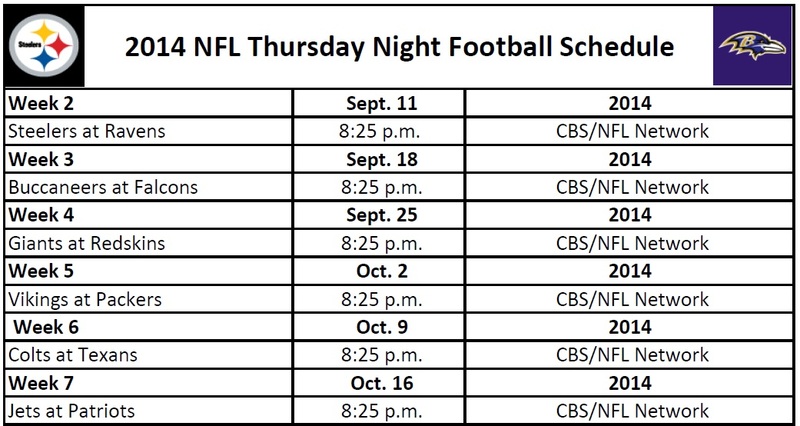 There are a total of 16 games in this year’s Thursday Night Football series. These games also include two Saturday games that are part of “Thursday Night Football” during the last week of the 2014 NFL regular season schedule (week 16). Although the first Thursday Night game occurs on September 4th, the NFL is actually treating this game as a special edition of Sunday Night Football. As a result, the regular Thursday Night telecasts will start-up during week 2 with the Pittsburgh Steelers traveling to take on the Baltimore Ravens. Only two of the total 16 games in the Thursday lineup this year do not feature divisional matchups in order to provide the most exciting matchups as possible for NFL fans. Although the NFL Network has traditionally aired the Thursday Night Football games, CBS will be showing the first eight games this year. The NFL Network will air the remaining half of the Thursday Night programming except for Week 16 during which both networks will air games on the Saturday broadcast. The 2014 NFL Thursday Night Football schedule is finally here with the official kick-off to the Thursday schedule to start during week 2 of the NFL season. Here is the complete Thursday Night football schedule in both printable and HTML formats for you to download, view, and print out if you choose. We also provide you with a printable NFL Thursday Night schedule in a printer friendly, PDF version.